In a phrase, "It's all fun and games until someone gets hurt." 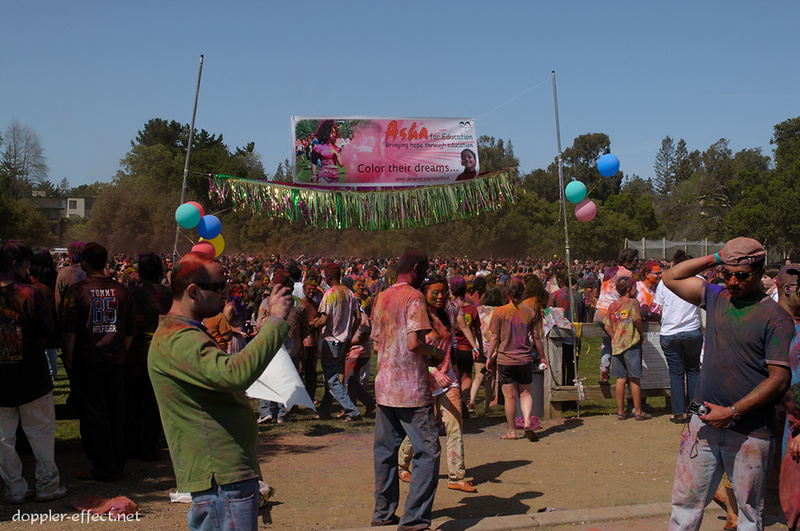 This past Saturday, March 27, I went to the Asha Holi celebration, held at a large, out-of-the-way field on Stanford's campus. The event website boasted a 2009 attendance of over 4,000. From the number of cars in the parking area, and the the density of people in the huge field, I could definitely believe it. 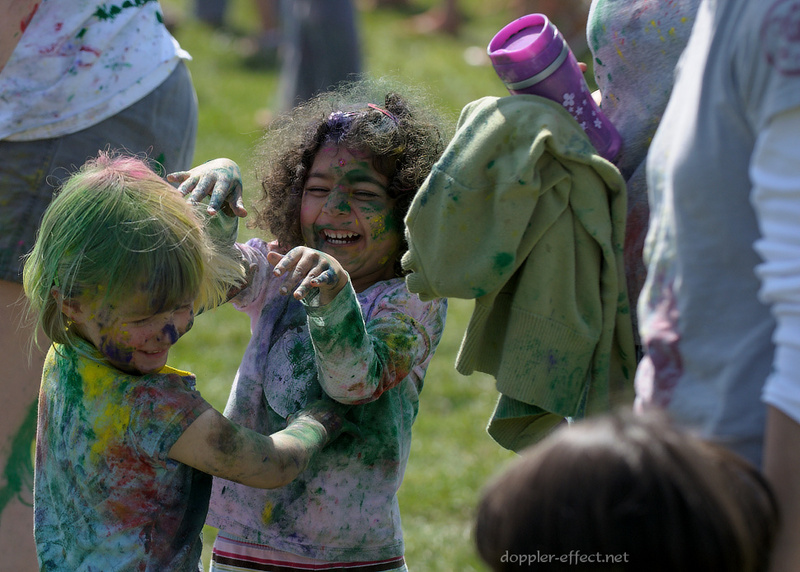 Having only ever been to a small Holi celebration, and that only as it was winding down, I expected to see a lot of people having a good ol' time, and in large part, that is indeed what I saw. However, I also noticed some patterns I found concerning. There were signs that some people were past the point of enjoyment, and that other people weren't taking those signals seriously. I saw joy, mirth, and frolic, but also witnessed fear, anger, and vengefulness. By the time I left, there were sufficiently many people in such a fervor as to cause me to question the crowd-safety of the event. As history has shown time and time and time again, it only takes a small amount of confusion before a large crowd ends up trampling people. What follows are my observations on how the situation developed, and some derivative realizations about human nature, especially as pertains to large crowds. A fantasy (as discussed by Douglas Hofstadter in Gödel, Escher, Bach) is, in a sense, a temporary suppression of reality. It's the result of asking "What if…" — a doorway that you can walk through to enter a social construct with different rules and different norms. You don't become someone else, but your perception of what is acceptable changes, so you feel comfortable doing things you otherwise might not. Most importantly, though, a fantasy is a pretense that you can, in theory, drop at any time. 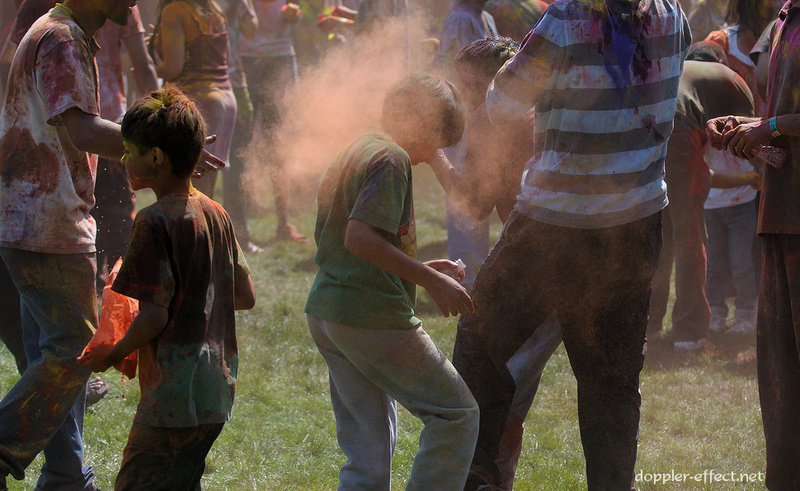 In the case of the Asha Holi celebration, the fantasy begins when you walk onto the field. It's usually not acceptable to throw pigment at people, and to dump water on people, but here it's ok. Even so, a fantasy has rules. When participants abide by those rules, people have fun. As mentioned earlier, one aspect that adds to the feeling of comfort and safety in a fantasy is the thought that one can get out at any time. That if things start going too far, you can just snap out of it and all will be well again. That here, fear doesn't imply danger. This was the first image that made me pause and think about what was actually going on in the playfield. While I was out there, watching and shooting, it looked as if these folks were having as good a time as everybody else; likely, they were. Later on, as I was going through photos at home, I was struck by the look of utter fear on the face of the man to the left. So there was fear. Fear isn't necessarily bad in and of itself — like many people, I love rollercoasters, and fear is often a large part of the enjoyment. However, when emotions like fear are present, a participant who observes the rules of the fantasy being bent or broken may experience anger and other more intense emotions. In a sense, a known-safe situation now has the potential for danger, which leads the participants to forget that they're in a fantasy; the fantasy starts to become a reality, and it becomes harder to just "snap out of it." The shift from enjoyable fear to terror often begins after a single event noticeably violates the rules of the fantasy. If a rollercoaster starts creaking a bit too much, or a rider's harness starts to come loose, the sentiment can change from "whee!" to "oh goodness, get me off of this thing now" in an instant. In the iconic Stanford Prison Experiment of 1971, this moment of betrayal happened on the second day of the experiment, when the prisoners staged a rebellion, during which they taunted the guards. The guards responded with force; after quelling the rebellion, they "generally began to harass and intimidate the prisoners." 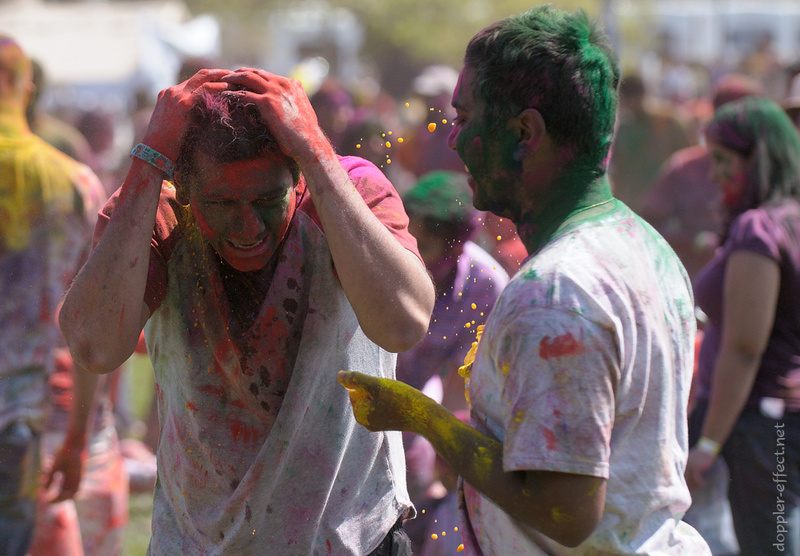 I saw and captured an analogous moment of betrayal at Holi. I noticed two boys — "green" and "orange" — just after orange had run past and thrown pigment in green's face. Having chatted earlier with two of the EMTs on site, essentially the only thing they were treating was people with pigment in their eyes, so presumably this sneak attack made green physically uncomfortable. Immediately, green began gesticulating in a "why did you do that?!" 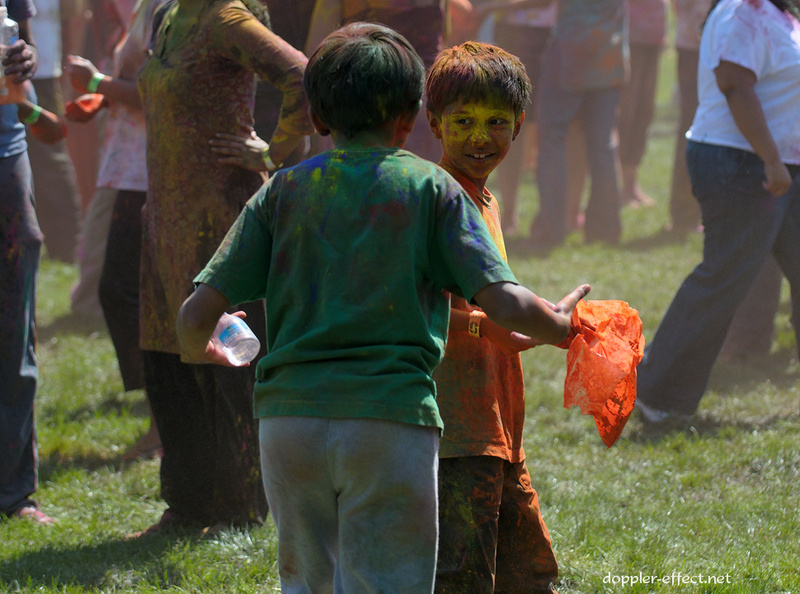 manner — in his mind, orange had likely violated one of the tenets of the "Playing Holi" fantasy. Green stomped after orange in what was a very clear display of anger, and was likely also an attempt to intimidate orange. As the two confronted each other, orange dismissively flicked pigment at green, in a sense ignoring the claims of foul play. Put another way, green had tried to get orange to "snap out of" the Playing Holi fantasy to realize that he had brought danger into a fantasy that should have been safe. Orange didn't comply, instead responding with what could be considered an act of disrespect — "your concerns aren't valid". 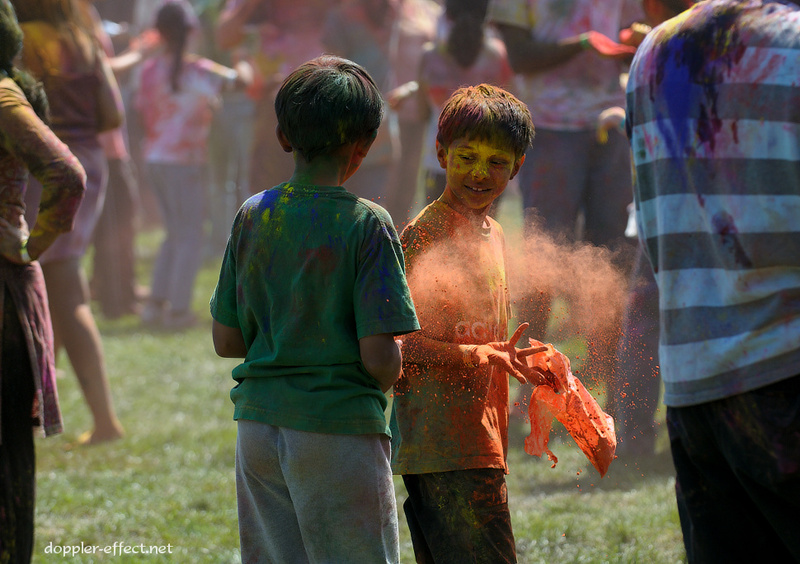 Considered within the Holi fantasy, the flick of pigment might have been appropriate, but taken outside of that fantasy, it could easily be thought of as a taunt. I have seen and heard of similar exchanges quickly escalating to violence. I don't believe that happened here, although the two moved out of sight before I could see how things played out. After witnessing the confrontation, I moved to the area where volunteers were distributing pigment. 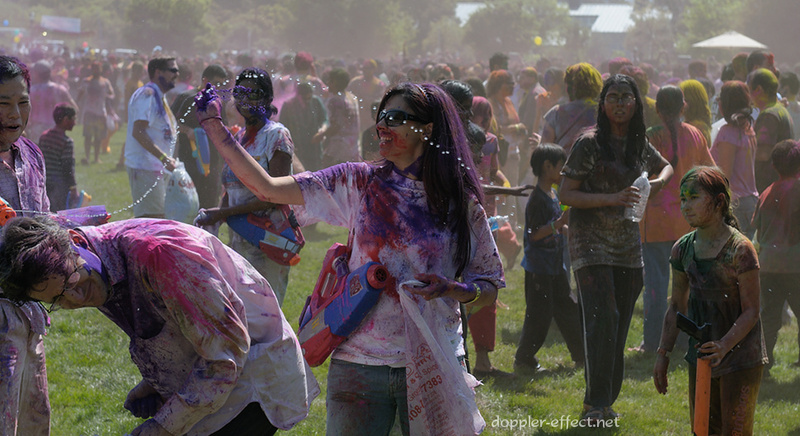 The volunteers worked feverishly to keep the pigment coming. 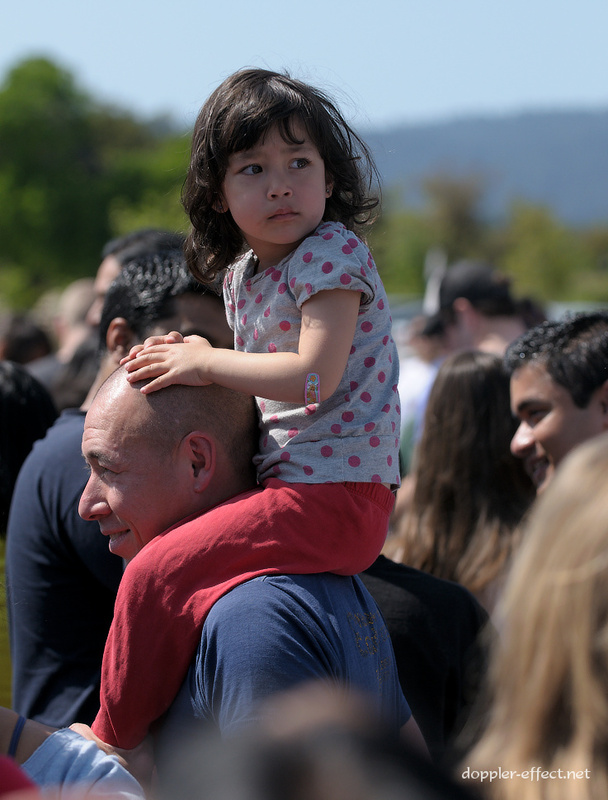 Despite the crowd's fervor, they appeared to be patient. Even so, in light of what I had seen moments before between the two boys, it seemed like a situation that would only require some small catalyst to turn sour. One potential problem I noticed was that some people didn't seem to follow the rules of a line. In one case, a young woman received pigment, slapped it on the faces of two young men behind her, and then held her hands out for more. 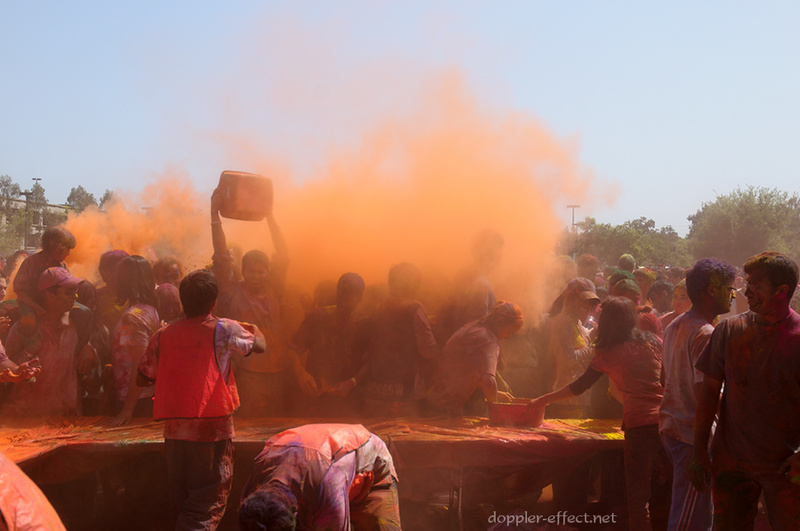 In the photo above, a man grabbed a bucket of orange pigment and threw it in the air. Again, as far as I could tell while watching, none of this led to any real confrontation. Had such a confrontation occurred, a panic would likely have ensued, especially given that everyone was pressed against everyone else. A volunteer I spoke with noted that the crowd was gradually pushing the tables inward. The pressing would have made it hard to flee in the event that something happened, and when people feel trapped, they often panic. All in all, this seemed like a fun event where whatever scuffles that occurred were few and minor, and the majority of people had a great time. That said, I still can't help but feel that it treaded perilously close to the line where fun can turn to danger. The short article "Crowd Panic…" mentions a number of situational properties that can lead to dangerous crowd panics. Foremost among them are "[lack of] sufficient exits and the absence of supervision." Needless to say, there was very little supervision. I noticed a couple security guards, but they were likely far too few to keep their eyes on everybody — the center of the area was essentially unpoliced. As for exit routes, consider the image above. If you follow the right sign-pole to the ground, you'll note that it's attached to a fence. The majority of the area was surrounded either by fences or by trees and brush, as visible in the distance. What few openings were present were generally impeded — the pigment distribution area, the tables where the EMTs were stationed, and the portable restrooms all blocked would-be emergency exits. I love the splashes of paint! These are so fun! Thanks. It's always neat seeing how granular solids behave like liquids. I was also blown away by the color saturation of all the pigments.